An organically grown bamboo kid's spork. As the clever name suggested this handy little utensil is a cross between a fork and a spoon - all wrapped up in a travel size package! This one is a baby version of the popular adult spork, and is perfect for when you are out and about. 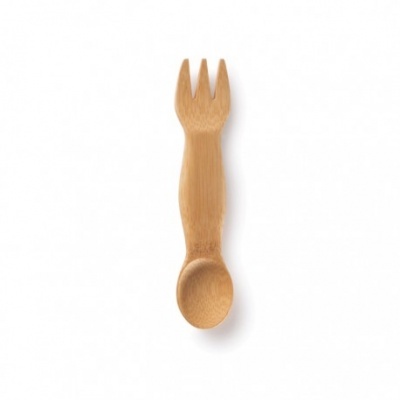 This nicely chunky utensil is made from a single piece of organically grown bamboo which is hand shaped and finished. Bamboo is more durable than wood and is heat & stain resistant. Recommended for 18 months +.